Every schoolchild can recognise continents or parts of them based on their shape. But why does Italy look like a boot, why is Australia an island-like continent and what sculpted Africa’s margins? In this study we address the underlying processes that shaped Earth’s continental plates when the last era of supercontinents came to an end, between about 150 and 100 My years ago. At the time when dinosaur evolution peaked, the southern continents were still united in the supercontinent Gondwana. However, vast continental rift systems comparable to the present East African rift, extended between present-day South America and Africa as well as within the African continent. These rifts are preserved as deep sedimentary basins in the subsurface of the African continent and along continental margins and document processes where continental crust is stretched like chewing gum. The so-called South Atlantic and West African rift systems were about to split the African-South American part of Gondwana North-South into nearly equal halfs, generating a South Atlantic and a Saharan Atlantic Ocean (see Image). 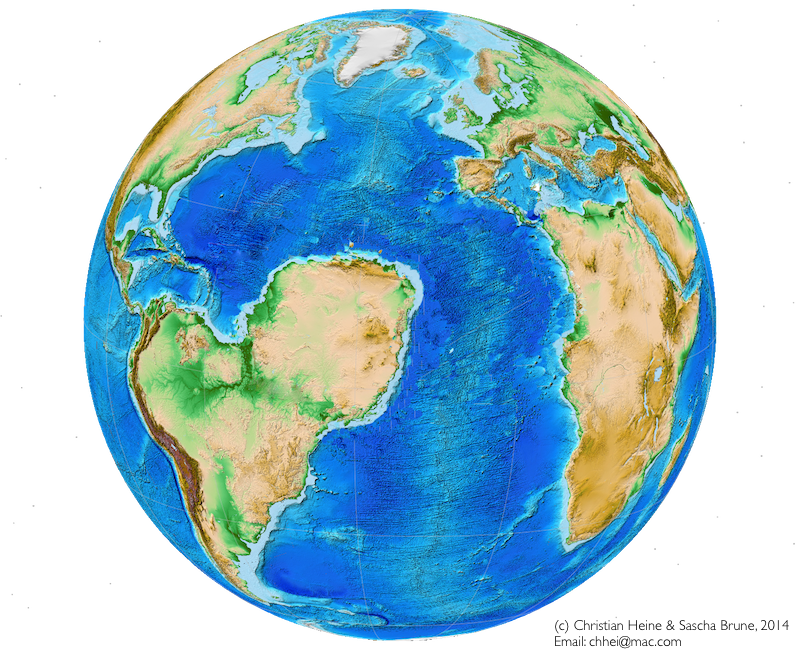 In a dramatic plate tectonic twist, however, a competing rift along the present-day South American and African Equatorial Atlantic margins, won over the West African rift, causing it to become extinct, avoiding the break up of the African continent and the formation of a Saharan Atlantic ocean. Our work elucidates the reasons behind the success and failure of these rift systems by coupling plate tectonic and advanced 3D numerical models of continental lithosphere deformation. We find that rift obliquity acts as a selector between successful and aborted rift systems, explaining why the South and Equatorial Atlantic Ocean basins formed and other rifts became aborted. Our modelling also sheds lights on the dynamics of rifting, suggesting that feedback loops caused a ten-fold acceleration in the velocities of the South American plate once the Equatorial Rift System had sufficiently weakened the last remaining continental bridge between both plates. One hundred years after the German scientist Alfred Wegener developed first ideas of continental drift, this study provides a new keystone in understanding the rules which govern continental extension and tectonic plate motion ultimately sculpting Earth’s continents into the shapes as we recognise them today. Rifting between large continental plates results in either continental breakup and the formation of conjugate passive margins, or rift abandonment and a set of aborted rift basins. The nonlinear interaction between key parameters such as plate boundary configuration, lithospheric architecture, and extension geometry determines the dynamics of rift evolution and ultimately selects between successful or failed rifts. In an attempt to evaluate and quantify the contribution of the rift geometry, we analyze the Early Cretaceous extension between Africa and South America that was preceded by ∼20–30 m.y. of extensive intracontinental rifting prior to the final separation between the two plates. While the South Atlantic and Equatorial Atlantic conjugate passive margins continued into seafloor-spreading mode, forming the South Atlantic Ocean basin, Cretaceous African intraplate rifts eventually failed soon after South America broke away from Africa. We investigate the spatiotemporal dynamics of rifting in these domains through a joint plate kinematic and three-dimensional forward numerical modeling approach, addressing (1) the dynamic competition of Atlantic and African extensional systems, (2) two-stage kinematics of the South Atlantic Rift System, and (3) the acceleration of the South America plate prior to final breakup. Oblique rifts are mechanically favored because they require both less strain and less force in order to reach the plastic yield limit. This implies that rift obliquity can act as selector between successful ocean basin formation and failed rifts, explaining the success of the highly oblique Equatorial Atlantic rift and ultimately inhibiting the formation of a Saharan Atlantic Ocean. We suggest that thinning of the last continental connection between Africa and South America produced a severe strength-velocity feedback responsible for the observed increase in South America plate velocity. The associated data for the plate kinematic model is available full and for free as open data from the Datahub.org pages (http://datahub.io/dataset/southatlanticrift) of my earlier South Atlantic paper in Solid-Earth.net. More detailed explanations and animations will follow later. The world as it might have looked like if the West African Rift system had been “successful” in forming a “Saharan Atlantic Ocean basin”. We explain in our paper why this did not happen. Made with GPlates and image manipulation. This entry was posted in Publishing and tagged Africa, Mesozoic, Plate reconstructions, Scientific publishing, South America, South Atlantic on 13/01/2014 by Christian.